The slope for Corra Bheinn (pron. ‘vane’) is closely parallel to the path of the setting sun, and so is suitable as a foresight. Four separate sets of measurements were made on different visits. 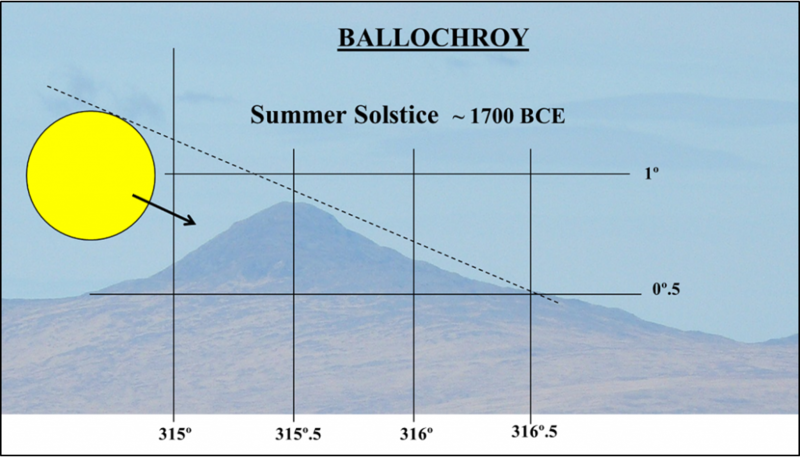 The results were in close agreement, and showed the path of the upper limb of the sun at the solstice (using the value for ε: 23⁰ 54ʹ.2 ± 0ʹ.7 as derived by Thom) was about 2ʹ of arc clear of the upper part of the slope.